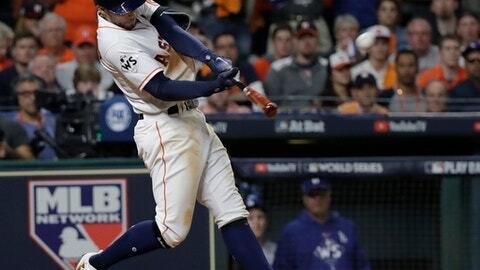 HOUSTON (AP) When Astros center fielder George Springer went 0 for 4 with four strikeouts in Game 1 of the World Series, some called for manager A.J. Hinch to move the All-Star leadoff man down in the order. His recent power surge is no surprise considering he hit a career-high 34 homers with 85 RBIs – also a career-best – in a season where he earned his first All-Star nod. ”It’s huge. I hope there’s somebody somewhere out there that is impacted and can learn to just go be who you are and not let any stage or any place stop you,” he said. ”It’s heartbreaking, but it’s also very, very humbling,” he said.